The image that comes to mind of the Zamorin is usually that of an old patriarch presiding over the destinies of his territory from the Calicut palace. The formula for succession - the eldest male member from the various branches of the family - confirms this impression that any member of the family gets to become the ruler only during the fag end of his life. Castaneda, for instance, who chronicled the meeting between the Zamorin and Vasco da Gama describes the former as 'well advanced in years'. However, there have been exceptions. Conflicts and diseases used to claim several royal lives and adoption of young boys and girls was a regular practice to ensure the continuance of the lineage. This often led to younger members of the family being called upon to take the reins. 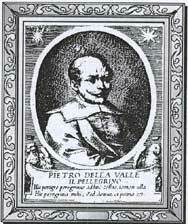 Pietro and his entourage reached Calicut by ship from Mangalore in the evening of December 21, 1623. He was travelling with a Portuguese Captain who was on a delicate mission of not only concluding peace with the Zamorin but also of brokering peace between the Zamorin and the Raja of Cochin. Malabar had witnessed a rather turbulent era (as described in detail by Maddy) and the new Zamorin had assumed the throne only in 1617. Pietro's description of Calicut's Bazar and its inhabitants is fascinating in its detail : the Market was full of all sorts of Provisions and other things necessary to the livelihood of that people. He found the hair style of the Calicut women the gallantest that I have seen in any other nation. He noticed that the residents were mostly Nairs, but the sea coasts are full of Malabari ( referring to the Moplahs). Pietro had no difficulty in walking into Zamorin's Palace where he and his Captain were almost forced to have an audience with the Zamorin. His description of the Zamorin as he walked into the hall to meet the visitors is graphic: After a short space the King came in at the same door, accompanied by many others. He was a young Man of thirty, or five and thirty, years of age, to my thinking; of a large bulk of body, sufficiently fair for an Indian and of a handsome presence. ... His beard was somewhat long and worn equally round about his Face; he was naked, having only a piece of fine changeable cotton cloth, blue and white, hanging from the girdle to the middle of the Leg. How hands-on the Zamorin was is clear from the curiosity he displayed on seeing in the hands of a soldier, who had accompanied Pietro, a short firearm with a large bore, which he was seeing for the first time, perhaps. He asked the firearm to be brought to him, emptied the gun power on the ground, and looked through the sight, shewing thereby that he was a good marksman, as they told us afterwards he was. Although Pietro mentions that the Zamorin kept talking about peace, no one was taken in by his words. The Portuguese knew that he was buying time for a large fleet to reach Calicut unmolested by the Portuguese at sea. For, this was the Manavikrama Zamorin who continued the war in Cranganore with greater vigour. 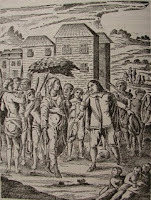 The envoy who came in the ship which brought Pietro was indeed on a mission to conclude a treaty of peace, but on condition not acceptable to the Zamorin. 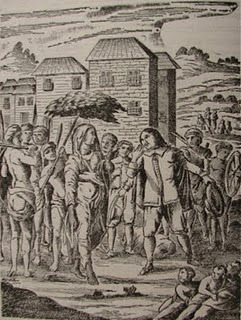 The Portuguese had pleaded that the Zamorin spare the King of Cochin who was their ally. The talks broke down and the war continued for another forty years, although the dashing young Zamorin died at the young age of around 40, on 10th April, 1627 at Calicut. As we are so much used to the images of old Zamorin Rajas one really finds it difficult to think that young Zamorins were also there. Is there any other descriptions of such a young Zamorin other than by the Italian traveller Pietro Della Vella? His description of Calicut's Market being full of all sorts of provisions along with article plundered at sea by 'Malabar thieves' reminds one of the smuggled items sold in Calicut even many many years ago.By the way one wonders who were the buyers for these foregin items. this is indeed a very interesting observation. I think there is one more instance of a young Zamorin. You can find it in Vissicher's accounts from the Dutch VOC period of a young Zamorin 30-36 years old. Something tells me to check if it is the period when adoptions from the neeleswaram branch took place. Very interesting to read about Manavikraman Zamorin. The account of the Bazaars of Calicut during Pietro's days too was believable. Thank you, Narayan,Geetha and PNS for the kind words! Maddy - Thanks for the information. We shall investigate further about the case mentioned by Visscher. Apparently, Zamorins those days were active on the battle fields. Neeleswaram adoptions also require to be looked at in more detail. Thanks for the lead.